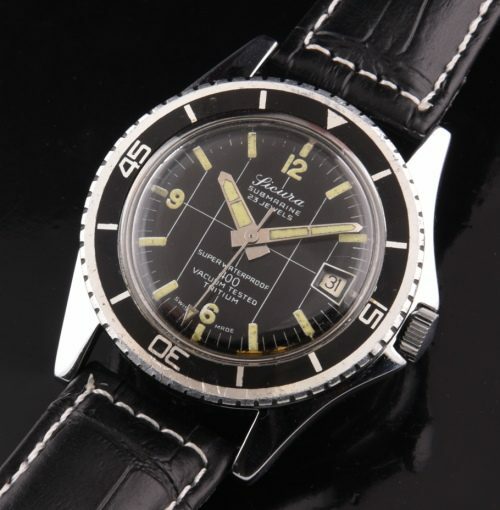 This 1960’s Sicura Submarine 400 offers that vintage dive watch look at a great price. Measuring 38.5mm., with pointed crown guards and a chrome plated case with turning bezel; you will love its vintage wrist presence. This watch isn’t a copy of the ROLEX SUBMARINER, but has its own look. Look at the original dial with aged luminous-awesome. The 23 jewel manual winding SWISS movement was just cleaned and is accurate. This is a cool watch-exceptional value.